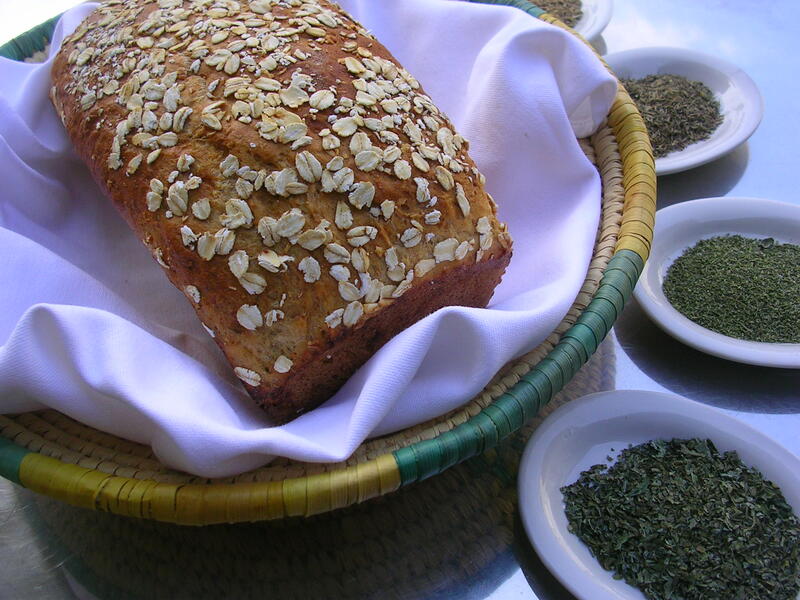 Claire’s bread is the reason why I started to grow summer savory, an herb I rarely use in cooking. I grow savory from seed until it’s strong and bushy and about to bloom, then I cut it down all at once and dry it. By late winter, the savory supply is gone, so my husband has to wait until mid-summer for more of his favorite bread. Even my son, until now a member of the Wonder Bread lobby, said it was good. I made a few changes to the original recipe, including honey instead of molasses, whose flavor I don’t like; whole-wheat flour plus gluten for a lighter texture; more savory and no dried parsley. Like all bread, it should cool completely before cutting. This is not easy to enforce if you have a bread lover lurking in the kitchen, just waiting for you to turn your back. 1. Dissolve the yeast in the lukewarm water and let stand 10 minutes until foamy. 2. In the meantime mix the butter with the honey in a small bowl. Mix the flours with the salt and gluten in a large mixing bowl, or the bowl of a stand mixer. Add the hot water and mix briefly. 3. Add the yeast mixture and the butter-honey. With the kneading attachment of the electric hand mixer, or with the stand mixer with kneading hook set on low, knead until a smooth dough forms. If the dough is too dry, add a little warm water; if it’s a little tacky, don’t worry and please don’t add more flour, otherwise the bread will be too dry. 4. Lightly oil a large bowl and place the dough in it. Turn the dough over once so it is evenly coated and cover with a kitchen towel. Let rise in a warm place for 1 hour. 5. Reserve 2-3 tablespoons of the oats and work the rest into the dough together with the dried herbs until well incorporated. 6. On a floured surface divide the dough into two equal pieces. Place them in greased loaf pans and cover with a kitchen towel. Let rise in a warm, non-drafty place for 45 minutes. 8. Mix the egg with 2 tablespoons cold water and brush onto the tops. Sprinkle with the reserved oats. 9. Place a jelly roll pan the lower rack of the oven. Fill it two-thirds with boiling water from a water kettle. 10. Bake 40 to 50 minutes until browned on top. If the bread makes a hollow sound when you knock on the bottom, it’s ready. Remove from the pan and let cool on a cake rack. This looks great – ii just put it on the top of my summer baking list.